In USA Today bestselling author Janette Rallison’s delightful novella, Job Hazards, Lydia Robinson is posing as a prostitute. Undercover of course. Lydia’s job as a police officer hasn’t reeled in her prince charming yet. That is, until Harrison Aldridge, old high school flame, pulls up to the corner to rescue the fallen damsel. 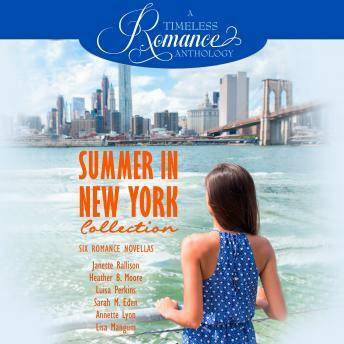 Lydia can’t exactly give Harrison the truth without blowing her cover, and it takes a series of mishaps and another whole set of misunderstandings before Lydia will even consider letting Harrison back into her life.In Heather B. Moore’s enchanting novella, A Taste of Sun, Winona Grant embarks on a summer-long visit to NYC to house-sit for her great-aunt after a nasty break-up with her boyfriend Paul. But when her aunt commissions neighbor Steve Monti to tour Winona around, they strike a deal. Winona has too many deadlines to play tourist, and Steve is looking for a distraction from his looming gallery opening. So Steve goes on the tours by himself, and Winona reports back to her aunt as if she’d gone too. The longer this happens, the more Winona wants to change her mind. Seeing the city with Steve might be the perfect solution to forgetting about Paul.In Luisa Perkins’s sweet romance novella, Dulce de Leche, Marisol is desperate for another nanny job after being unfairly fired from her previous position. She has only two more semesters of college, but she’s too proud to ask her wealthy parents for financial help. When her potential new employer, a single father working long hours as an anesthesiologist, decides she’s too young and pretty to hire, she practically begs him for the job. Darius finally agrees, and as he watches her work miracles with his Asperger’s son, he realizes there is much more to Marisol than he first believed.In Take a Chance, a captivating story by Sarah M. Eden, Miguel Santos has a stopover in New York. When the announcement of delayed flights comes over the PA system, Miguel is looking at spending several hours at the airport. Determined to get comfortable for the long wait, he’s surprised when he spies a familiar face amongst the stranded passengers: Jane Schoonenburg, the last person he expected to see. Three months have passed since he asked Jane to marry him—three months of misery. And now he knows that he must talk to her, if only to find out why she broke his heart.Annette Lyon’s entrancing novella, Firsts and Lasts, begins with Dani’s last week in New York. She’s failed in her dreams to catch a break as an actress and is now ready to return home and dust herself off. As she visits the places on her final to-see list, she meets Mark, another New York City transplant with big dreams. Except Mark hasn’t given up on his. As they spend the day together, Dani realizes that even though she hasn’t hit the “big time” she might be living her dream after all. Only problem: she has a one-way ticket back home.In Lisa Mangum’s whimsically titled story &, Lucy is riding a wave of success at having found a bestselling novel in the slush pile at an exclusive New York publishing house. If only her personal life was storybook perfect as well. Her relationship with Devon is on the rocks, and even though she's been put in charge of the house while her boss is gone on business, Lucy isn't sure she's up to the task. It will take a chance encounter with a handsome wordsmith to help Lucy claim the courage that has always been a part of her heart.